With the federal government spending more than $10.1 billion a year on the National School Lunch Program (NSLP) to feed some 31 million school children in over 100,000 schools each day, there is a national policy debate and a competing movement of local initiatives to bring healthier options to the school cafeteria. Michelle Obama made this her cause at the national level. Countless others, such as the FoodScience Lab at Chicago’s Carl Schurz High School, are making positive change happen at the local level. NPQ articles addressing this subject reach back years, whether discussing the nuances of school lunch, as here, here, and here, or, most recently, covering school funding in general. In Italy, students get Caprese salad (fresh mozzarella, tomatoes, and green basil), local fish on a bed of arugula, and fresh fruit and bread at school for lunch. In France, each day’s lunch menu is planned months in advance by a school’s certified dietitian and might include cucumber and tomato salad, veal marinated with mushrooms, broccoli and cheese—and for dessert, an apple tart. At Carl Schurz High School on the northwest side of Chicago, students enjoy arugula, tomatoes, microgreens, and kale. They harvest the fresh vegetables themselves in hydroponic growing systems at the school’s Food Science Lab. They grow enough each week to give the surplus to the local food pantry. Though the American Institute of Architects placed Schurz High School among its “150 great places in Illinois,” this is not a private school for elite kids who vacation in Italy and France and eat just as well at home. Nine out of 10 students are economically disadvantaged. Still, thanks to local leaders, Schurz students will soon be adding prawns to their aquaponics system. “For many students, it’s not only the first time they’ve tasted fresh greens, it’s the first time they’ve been able to trace the origin of their food,” reports Civil Eats. The national school-lunch program began in 1946 by addressing the undernourishment of children “as a measure of national security” with surplus agricultural commodities. Today, the problem is over-nutrition. Treat pizza and French fries as vegetables, and the federal reimbursements flow. Today, more than one-third of American students are obese or overweight. Childhood obesity and the associated diabetes epidemic is driving much of the school food and nutrition debate. Seeking healthier national standards for school meals gave rise to the Healthy, Hunger-Free Kids Act, signed into law in December 2010. Michelle Obama championed this legislation, giving the USDA authority over schools’ nutritional standards and regulations. The Act was set to be reauthorized by Congress on September 20, 2015, but they did not do so. Nevertheless, the funding of the Act continues. Obama initially took on childhood obesity as one of her priorities, starting an initiative called Let’s Move to promote exercise. But without changes in diet, she realized exercise alone could not compete with obesity and diabetes. 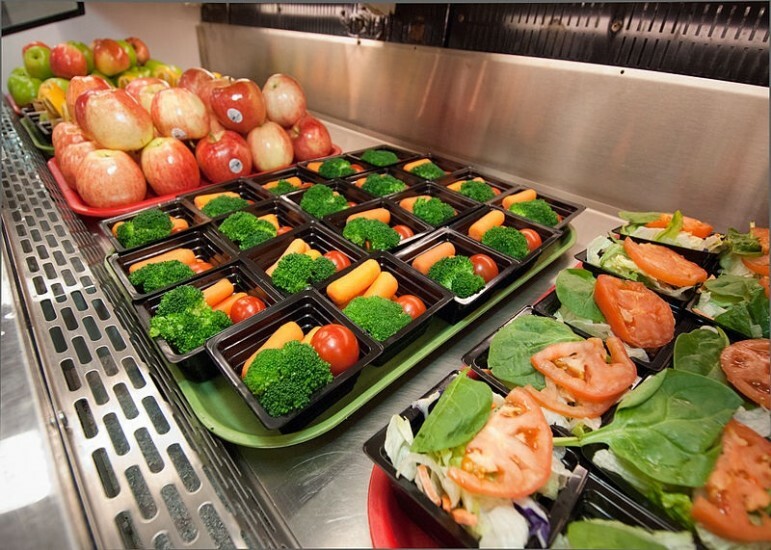 The corporate-sponsored School Nutrition Association is a vocal opponent of the act, claiming school districts do not meet the guidelines and that students throw the healthier food away. Not surprisingly, the Food Resource and Action Center and various studies make opposite claims. There may be no single easy fix, but the Schurz Food Science Lab demonstrates that as young people grow and share food, they develop healthy eating habits and values along the way. This innovative local initiative also proves it takes steady pressure to make change happen at the community level. It took five months to convince the Chicago Public Schools administration to permit Schurz students to consume the food they were growing. In Chicago’s poor black neighborhoods, shuttered public schools have stayed vacant for years. Failure to include the community in decisions about the neighborhood’s future has stymied redevelopment plans.